Larry Q. Evans. Courtesy of the Legislative Reference Library of Texas. Image available on the Internet and included in accordance with Title 17 U.S.C. Section 107. Harris County District 147 Map. Courtesy of Texas House of Representatives. Image available on the Internet and included in accordance with Title 17 U.S.C. Section 107. 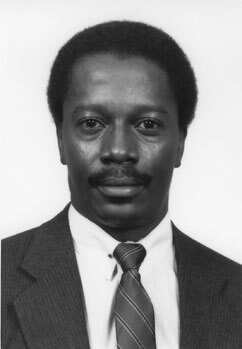 EVANS, LARRY QUINCY (1948–1991). Larry Quincy Evans, orator, civil rights lawyer, and state legislator, youngest of five children born to Newell and Ida Mae (Blakeney) Evans, was born on October 13, 1948, in Richmond, Texas. Evans attended the public schools of Fort Bend County and was a National Merit scholar and graduate of Lamar High School. He earned a bachelor of arts degree in political science from the University of Texas at Austin, a master of arts degree in sociology from Texas Southern University in Houston, and a law degree from Texas Southern University’s Thurgood Marshall School of Law. Evans, a Democrat, served as a legislative aide to State Representative and Senator Craig A. Washington, Congresswoman Barbara Jordan, and State Senator Chet Brooks. He was elected to represent District 147 in Houston for five successive terms in the Texas House of Representatives beginning in 1982. Evans served as vice-chair of the House Research Organization, assistant majority whip, and he was a member of the steering committee of the House Democratic Caucus. He was also an active member and chairman of the Legislative Black Caucus. During his legislative career, he served on numerous committees, including the Appropriations Committee, the Committee on Labor and Employment Relations, and the Committee on Criminal Jurisprudence. He was appointed vice-chair on Ways and Means and was a member of the Committee on Judicial Affairs and the Committee on Local and Consent Calendars in the Seventy-second Texas Legislature. Acknowledgement of Evans as a member of the Texas Legislature. Courtesy of the Legislative Reference Library of Texas. Image available on the Internet and included in accordance with Title 17 U.S.C. Section 107. Evans was a “forceful and articulate advocate of individual rights, civil liberties, civil and human rights, and free labor as well as an effective supporter of public education and social service programs.” He authored more than 100 bills and resolutions, and his legislative priorities included judicial reform, prison reform and recidivism reduction, divestment of racist investments by public institutions, tax reform, and institution of a lottery. Moreover, he passed legislation on behalf children, minorities, the poor, the deaf, Texas Southern University, county governments, firemen, podiatrists, bailiffs, and judges. Evans practiced law with the law firm of Washington & Randle as well as the firm of Lampley and Evans; he was admitted to practice before the United States district courts for the Southern District of Texas, the United States Court of Appeals for the Fifth Circuit, and the Supreme Court of the United States. Evans was a member of the Texas Trial Lawyers Association, Houston Lawyers Association, National Bar Association, and the Thurgood Marshall Law School Alumnae Association. Often referred to as the “conscience of the legislature” during his terms of service, Evans’s reminder that “justice delayed is justice denied” was frequently touted by his colleagues during legislative sessions. At the time of his death in Austin on August 7, 1991, Evans had begun a campaign to gain minority representation on the judicial benches of Texas and to reform the judicial process. He died from an adverse drug reaction; he was forty-two years old. He was survived by his wife, Charlene Taylor Evans (a professor at Texas Southern University), and sons Larry Quincy II and Jon Alan Evans. He was buried in Spring Green Cemetery in Richmond, Texas. Houston Chronicle, August 8, 9, 10, 13, 1991. Legislative Reference Library of Texas: Larry Q. Evans (http://www.lrl.state.tx.us/legeLeaders/members/memberdisplay.cfm?memberID=340), accessed May 6, 2013. Handbook of Texas Online, Charlene Taylor Evans, "EVANS, LARRY QUINCY ," accessed April 22, 2019, http://www.tshaonline.org/handbook/online/articles/fevml. Uploaded on May 15, 2013. Modified on February 9, 2017. Published by the Texas State Historical Association.